It has no known cure, prevention or effective way to slow the progression. Someone develops it every 66 seconds. Currently, 220,000 Illinois residents are living with it. It’s the 6th leading cause of death in the United States. What is it? Alzheimer’s disease. But these facts tell nothing of the daily toll it takes on the person living with it, their families and their caregivers. What can you do about this growing epidemic? Join the Jacksonville community as we raise funds to support the Alzheimer’s Association’s mission to eliminate Alzheimer’s disease through the advancement of research, to provide and enhance care and support for all affected and to reduce the risk of dementia through the promotion of brain health. Jacksonville is hosting a Walk to End Alzheimer’s in conjunction with the Springfield walk in September. The Jacksonville walk will be on Saturday, September 10, at Community Park. Please go to the Rotary playground near the pavilions for the walk, which will start before the Be Aware Wellness Fair. Lisa Kluge from Heritage Health and Becky Hatlee from Home Instead Senior Care are the local individuals who are working alongside the Alzheimer’s Association to bring this event to town. They are spreading the word about this event and can be contacted for more information. You can also reach out to the Alzheimer’s Association directly at 217-726-5184. If you are interested in starting a team or joining a team, you can visit the website at: http://act.alz.org/springfield2016. This website shows the details of the 2016 Springfield Walk to End Alzheimer’s, but you will be notified and updated about the Jacksonville walk specifics as the date draws closer. Alzheimer’s disease is a growing epidemic, but you can help. Walk with us in honor of your mother, father, aunts, uncles, cousins, neighbors and friends. Walk with us for future generations – your children and grandchildren. Walk for yourself. 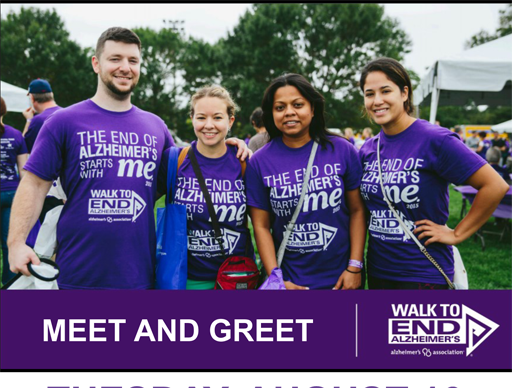 Want more information about the Walk to End Alzheimer’s in Jacksonville and how to get started? We are having a “Countdown to the Walk Meet and Greet” event at The Soap Co. Coffee House on Tuesday, August 16 from 4 – 6 p.m. Stop by for any or all of the event, and meet others who are taking the next step in helping others and finding a cure. A MacMurray College graduate, Tina Arnold currently calls Springfield home. Arnold works full time at the Alzheimer’s Association in fundraising as Senior Manager, Special Events.